Topographic map of the Bulgarian Base area featuring the chapel's old and new premises. 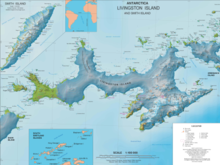 Topographic map of Livingston Island and Smith Island. Penguins open Bulgaria’s EU bid. Sofia Echo, 30 January 2003.